Selling products like clothing, footwear or other wearable products creates a requirement to show perfect size options to customers for ease of purchase. Customers never compromises with sizes when it comes to buying. As of now, multiple brands are selling and sizes of each differs and thus is creates confusion for users to select the perfect size. 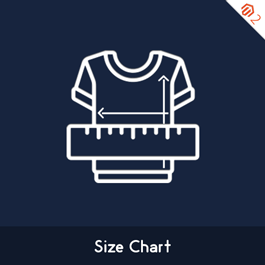 Magento 2 Size Chart extension by MageComp gives you an option to set size chart from backend and show it on frontend for customers to ease sizing decisions. Admin can set image, static block, text, table or whatever from backend to display as size chart in a popup on frontend. Customers will get a button on product page to click and see size chart in a popup. Why choose Magecomp’s Magneto 2 Size Chart extension: •	Responsive popup to show chart in product view page. •	Set image, CMS block, table or any HTML code through WYSIWYG editor to show size chart in frontend. •	Set global, category specific and product specific size chart from backend. •	Display size chart either in product page content or in popup •	To open size chart in popup you can set: o	A button with text o	Icon image o	Icon image + text •	Icon image supports jpg, jpeg, gif, png image type.